Sorry, I couldn't help myself (so sooo punny!). Why the "whole" in the title? Ricotta is actually traditionally made from the whey left over after cheesemaking, hence the "ri" (re) "cotta" (cooked). You acidify the whey or wait until it has acidified naturally after sitting for a few hours at room temp (the cultures from your first batch of cheese are still working away in there!) 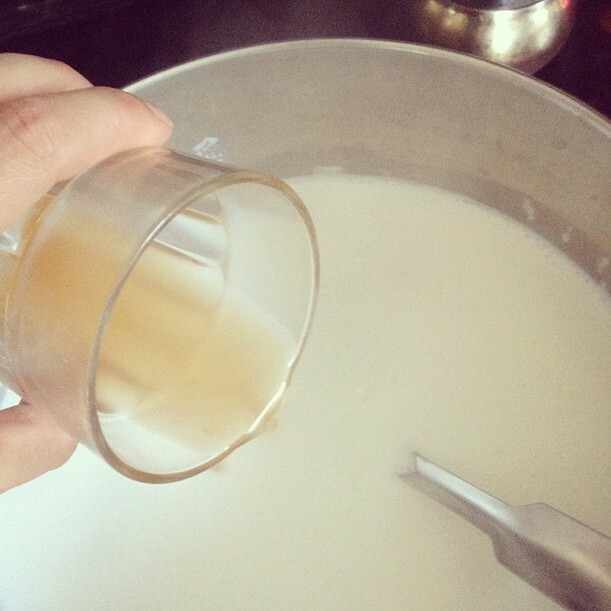 and then heat until the remaining curd begins to precipitate from the whey. Any who - that's not what I made on this particular day. 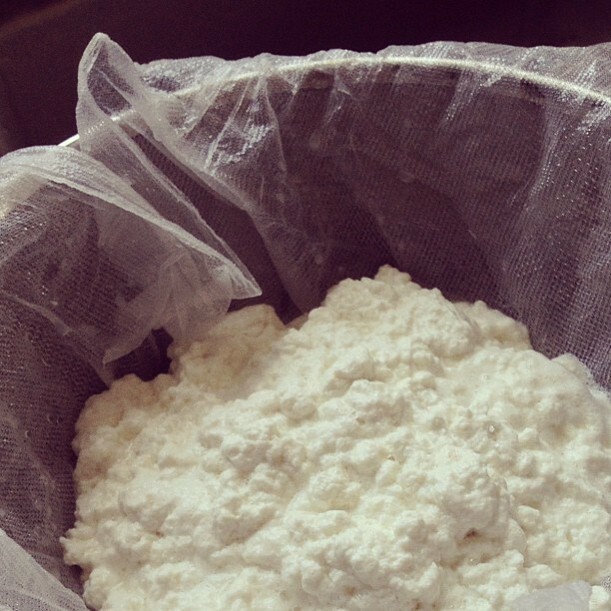 I wanted ricotta but unfortunately didn't have time to make any more than one cheese. Luckily, I'd been there before and knew just what to do. 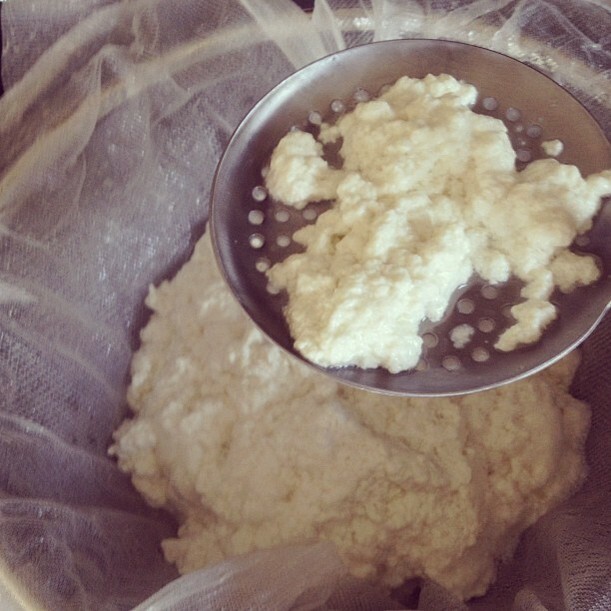 I put a half gallon of our milk in my small cheesemaking pot and about 15 minutes later, I had a little over a cup of creamy delicious ricotta. And no, I wasn't going to make lasagna. I was going to eat this stuff on Scrapple's homemade bread with honey and jam, whip it up with some pesto to eat with raw zucchini, and plop the rest on a pizza. At least that's what we've done with this batch so far... A lasagna may still be in order - it made so much that there's actually some left 3 days later! 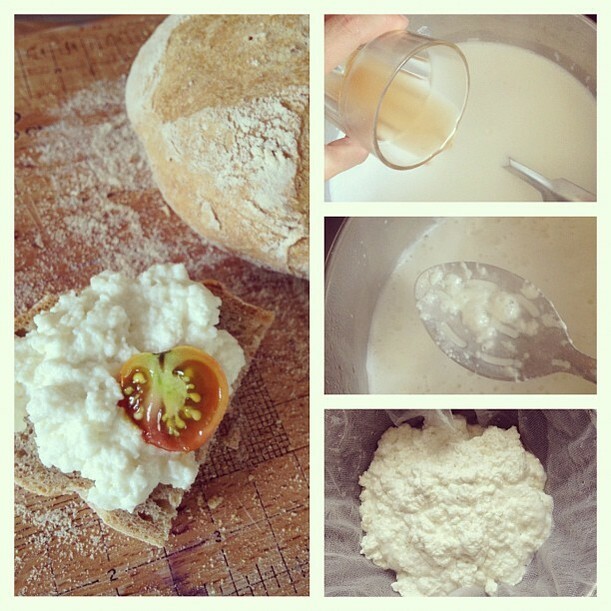 I haven't made this recipe with cows milk, but imagine it would be just as delicious. 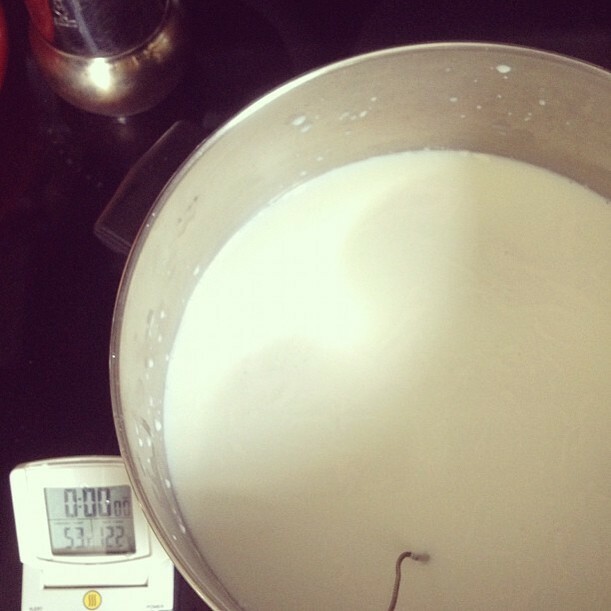 If you use store bought milk though, just be sure that it isn't UHT (ultra high temperature pasteurized). No cheese is gonna be coming out of that stuff, no sir-e.
First of all, sanitize your pot, colander, cheesecloth, and utenils to stir and scoop by washing in hot soapy water, rinsing with water spiked with bleach, and finishing with a water rinse. 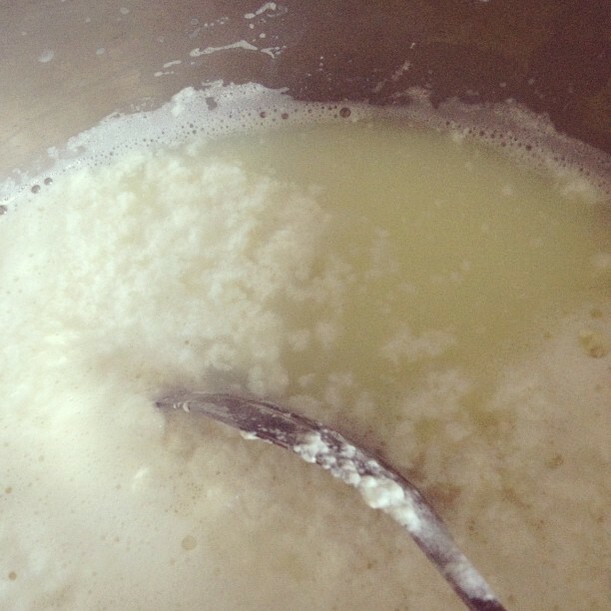 pea sized flakes of curd should start to seperate and float to the surface and the remaining liquid, the whey, should gradually become lemony in color and translucent. If this doesn't happen, continue to heat to 205 (and if that doesn't work, you could always ad a tad more ACV, but not too much or your cheese will take on its flavor). Let the curds rest for a minute and then scoop into your lined colander. Voila! After draining for a minute, salt to taste and allow to drain a minute more before eating or storing.